Yes, 20 miles (32km). You read that right. To get an image of just how far that is, imagine 423 (and a half) jumbo jets lined up in front of one another. That is a LONG distance. Believe it or not, there are Electric Skateboards that CAN take you that far. We’ve whittled down the list and selected 3 boards that do just that, while still being reasonably affordable (read: for enthusiasts). While there are certainly other boards that are just as impressive, as you’ll see when you look at an incredible list of eSk8s that travel up to 15 miles, the boards listed here are a bit more impressive – mileage-wise. Please keep this in mind: when you ride uphill, the battery gives the motor more juice to get up that hill. As a result, your battery drains faster – and making those 20 miles becomes less likely. With that out of the way, here are 3 high-quality Electric Skateboards that can take you more than 20 miles on just one battery charge. Let’s get a few things straight: riding for 20 consecutive miles on a single battery charge is impressive. What’s more impressive? Riding for 22 consecutive miles, which is precisely what Acton’s Blink QU4TRO Electric Longboard does. The main reason for this (as suggested by the name) is thanks to not one or two hub motors, but four. This extra power and battery energy takes you twice the length of single/duo hub motors (which is understandable). Another reason you can travel this amazing distance is due to Acton’s manufacturing decision to make the deck out of carbon fiber – which is 10x stronger than steel while being a fraction of the weight. Did I mention that the chassis is made of aircraft-grade aluminum? This means that the chassis provides the unbelievable strength of commercial aircrafts without adding any unnecessary weight. 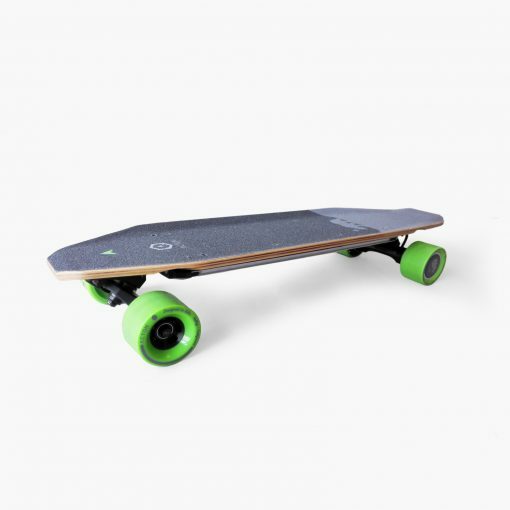 Both the aluminum chassis and carbon fiber deck are premium-grade lightweight materials that help the board “chug along” mile after mile without a problem. When it comes to eSk8s, eGlide (makers of GT Powerboard) know their stuff. (Which they should, since they’ve been in this industry for 11 years.) When it comes to this board, your choice of battery pack can be equipped. The SLA battery takes you up to a 15-mile distance, and the H2A Lithium Battery takes you up to a whopping 22 miles maximum. This is a tremendously long distance considering the 800W motor is on-par with a lot of industry-standard eSk8s. Equally as noteworthy is the fact that it goes from 0-23mph in five seconds. When you take the Tomahawk out for a ride, expect to blaze through the wind at 20mph for a total distance of 20 miles, depending on your speed and body weight. Genesis makes the claim on their website that the remote control can last up for 7 days on a single charge. While I’ve yet to see anybody back this claim up, it’s impressive to think about. What’s remarkable about the 800W motor and 36V 4.3Ah battery is that you can also climb any 20-degree hill with relatively no trouble. This is only the start of eSk8boards that can take you more than 20 miles on a single charge. As technology advances and manufacturers are given more resources, eSk8s are constantly upgrading each and every year – whether brands are popular or lesser-known, electric skateboards seem to evolve every year. Although the total distance traveled between these 3 boards are awesome, this shouldn’t be the only factor that goes into buying an electric skateboard, as we talk more about. Remember: any electric transportation device is an investment, and should be thoroughly researched diligently.